Explain the difference between report charts and dashboards. Create a dashboard and underlying report. Ursa Major Solar relies on great reports to help make decisions and take action, like who to call today, but sometimes they need to get the big picture. 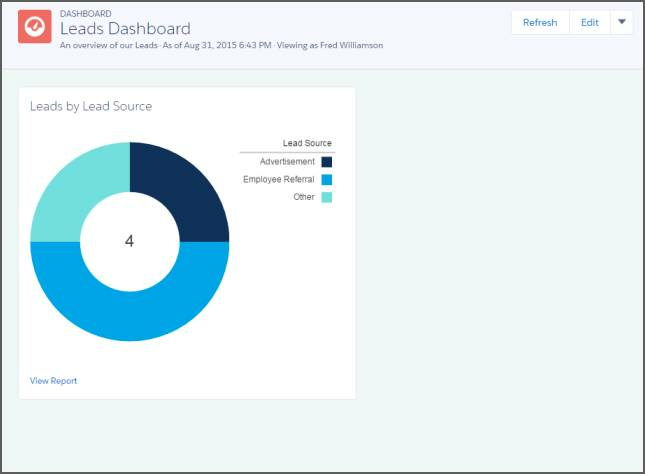 Enter the dashboard, unmatched in its ability to summarize and display Salesforce data in a graphical layout. 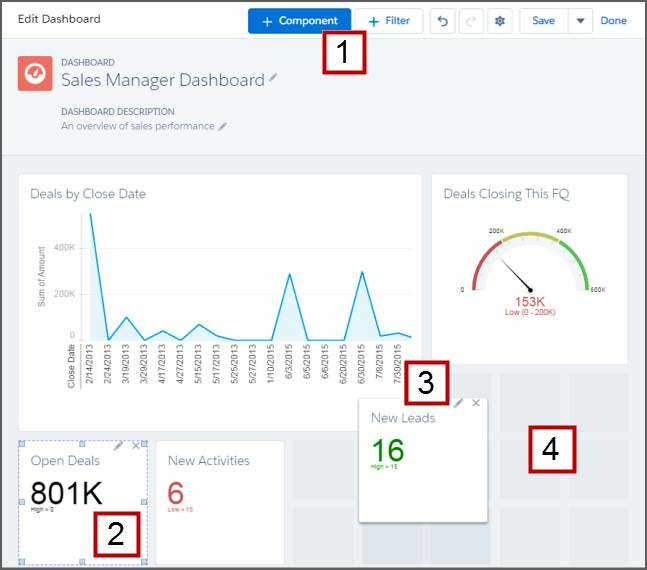 Salesforce dashboards present multiple reports side-by-side using dashboard components on a single dashboard page layout. Dashboard components come in a variety of chart types, tables, metrics, and gauges, and you can customize how data is grouped, summarized, and displayed for each component. 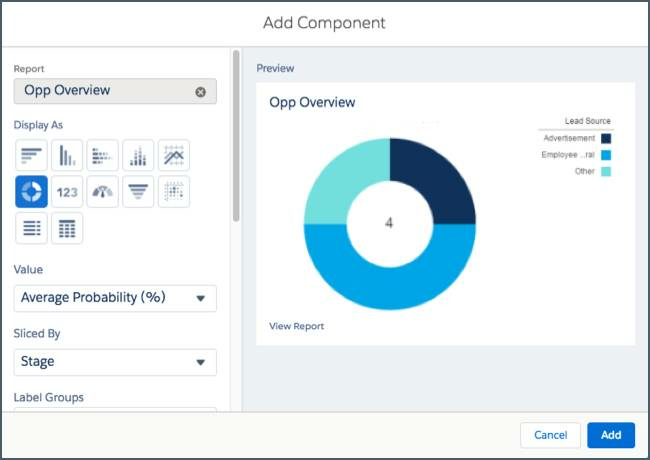 The drag-and-drop dashboard builder is an intuitive interface for building dashboards from source reports you’ve created in Salesforce. In addition to dashboards, you also have options to add charts to reports and record page layouts. Read on to learn how to visualize data with report charts and dashboard components. Meet the drag-and-drop dashboard builder, your way to visualize your data for easy consumption at-a-glance. Launch the dashboard builder from the Dashboards tab by clicking New Dashboard. Enter a name for your dashboard and click Create. Insert a component onto your dashboard by clicking + Component, or add a filter by clicking + Filter . When prompted, select a report and chart type for your new component, or a field and criteria for a filter. Each component shows data from one report. After you’ve added a component, click on it to resize it, delete it, or change its data-supplying source report ( ) . Position your components by dragging and dropping them . A responsive grid layout supports components of different sizes in diverse arrangements . Use a chart when you want to show data graphically. You can choose from a variety of chart types. Use a metric when you have one key value to display. Use a table to show a set of report data in column form. Finally, when selecting a source report for use in a dashboard component, note that you can’t choose joined reports or historical trend reports. Roberto mentioned Maria on Chatter to ask for a comprehensive overview of Ursa Major Solar’s sales pipeline. Let’s help Maria create a dashboard for Roberto. First, we’ll create the source report we’ll use in the dashboard. Let’s make a simple Leads report. Click the Reports tab, New Report and select Leads as the report type. Click Continue. For the Show Me standard filter, select All Leads. Click Apply. For the Date Field standard filter, select Create Date. For Range, select All Time. Click Apply. Click OUTLINE and group rows by Lead Source. From the Add group... lookup, select Lead Source. Ensure that these columns are included in your report: Lead Owner, First Name, Last Name, Title, Company/Account, Rating, Street, Email. Click Save, name your report Leads by Lead Source, and accept the auto-generated unique name. Now that your report is created, let’s visualize it using a dashboard component. From the Dashboards tab, click New Dashboard. Name your dashboard Leads Dashboard and, optionally, enter a description. To insert a component, click + Component. 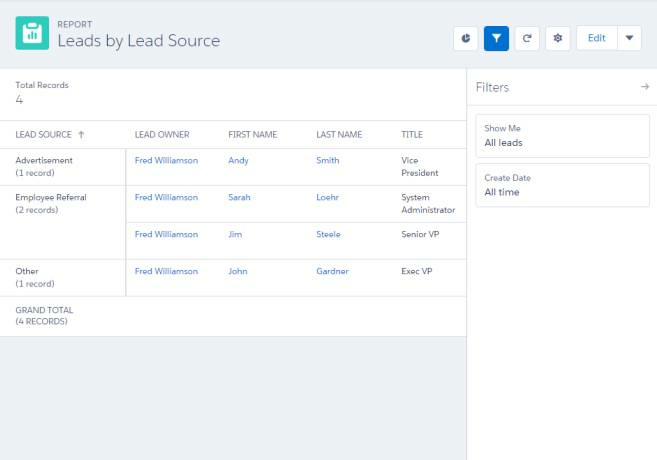 From Select Report, choose the Leads report you created earlier, Leads by Lead Source, and click Select. From Add Component, select the donut chart. Confirm that your component is titled Leads by Lead Source. Optionally give your component a subtitle and footer. Click Add. Your new component appears on the dashboard. Optionally, resize your dashboard component by clicking on it, then dragging the corners and sides. Click Save and then click Done. Your dashboard should look something like this. Great job! You just built a simple report and dashboard for visualizing leads by source. With dynamic dashboards, each user sees the data they have access to without needing to create separate dashboards for each user. This means a single powerful dashboard can be used for multiple users in your company, because the logged-in user viewing the dashboard sees the data they should see, based on their security and sharing settings. Sales reps should only see their own data; managers should only see data for the reps they manage; and the VP should see data across the entire team. In this scenario, Maria typically would have to create 45 different dashboards—one for every single person. She’d also have to create multiple folders to manage access rights. All users only see data that they can access. Sales reps see their own bookings and activities. Managers see bookings and close rates for the reps they manage. The VP sees bookings and close rates for the whole team. Because the metrics are the same for managers and the VP, you can use the same dynamic dashboard for both roles. The dynamic dashboards feature reduces the number of required dashboards from 45 to two! Managers with the “View My Team's Dashboards” or “View All Data” permission can set an option to preview the dashboard from the point of view of users under them in the role hierarchy. From the Dashboards tab, create a new dashboard or edit an existing one. Open the Properties menu by clicking . Me — Dashboard readers see data in the dashboard according to your access to data. For example, if you can only see Opportunities in Canada, then dashboard readers only see data about Opportunities in Canada. Another person — Dashboard readers see data in the dashboard according to the data access level of whomever you specify. For example, if you choose someone who can see Opportunities from any country, then dashboard readers see data about Opportunities from all countries. The dashboard viewer — Dashboard readers see data as themselves, according to their own access to data. These types of dashboards are often called dynamic dashboards. Your organization can have up to 5 dynamic dashboards for Enterprise Edition, 10 for Unlimited and Performance Edition, and 3 for Developer Edition. Dynamic dashboards aren’t available in other editions. Additional dynamic dashboards may be available for purchase. Dynamic dashboards don’t support following components. You can’t save dynamic dashboards in private folders. You can’t schedule refreshes for dynamic dashboards. They must be refreshed manually. Optionally, select Let dashboard viewers choose whom they view the dashboard as to let a reader with appropriate user permissions choose who they view the dashboard as. With the “View My Team’s Dashboards” user permission, the reader can view the dashboard as themself or as anyone beneath them in the role hierarchy. With the “View All Data” user permission, the reader can view the dashboard as anyone. From the Properties window, click Save. Then, from the Dashboard Builder, click Save again. When people open your dashboard, they see data as the person that you specified. If you don’t want to create a dashboard, but just want to add a chart to your report, then report charts may be right for you. Report charts allow you to place a single chart right at the top of your report, so that when you view the report, you can see the chart and the report results in one view. From the Reports tab, open the report you made earlier, Leads by Lead Source. A chart may already appear at the top of your report. You can show or hide the chart by clicking the chart icon ( ). Presto! You just added a report chart to your report.